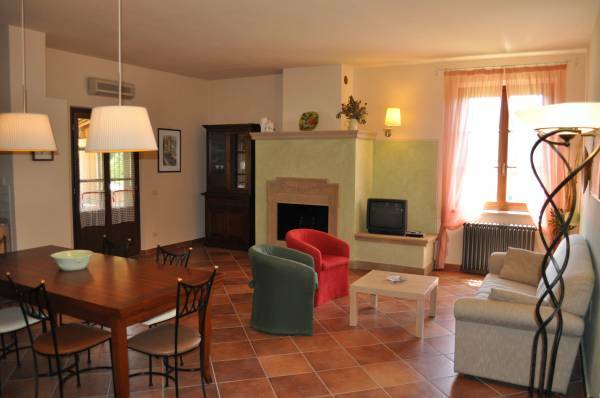 The Holidays Home Il Casale del Madonnino has 4 holidays apartments to rent in Tuscany. Each tuscan holidays apartment is equipped with all comforts: dishwasher, glass-ceramic cooktop, electric oven, fridge freezer, air conditioning, fireplace and private barbecue. Furnished in the typical Tuscan style, these apartments have wooden beam ceilings, terracotta tile flooring and wrought iron beds. Each Tuscan holidays apartment measures around about 110 sqm. In addition, each tuscan apartments in the holiday home has a large veranda in the garden or on the terrace with a scenic view over Volterra and the beautiful hills of Tuscany.